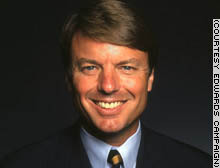 Freshman North Carolina Sen. John Edwards entered the race January 2, 2003. A millionaire who made his fortune as a trial lawyer, Edwards is one of two Southerners in the race. Edwards was considered a possible running mate for Vice President Al Gore in his unsuccessful bid for the White House in 2000. Against military tribunals and labeling U.S. citizens "enemy combatants"